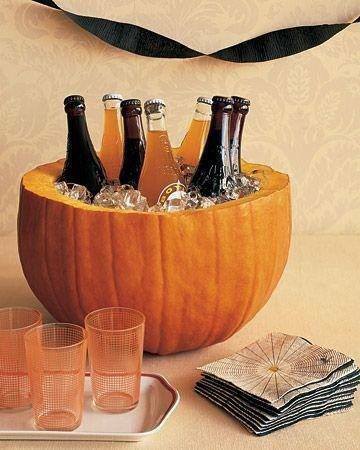 So simple and makes a big impact with your other party creations. Simple cut a pumpkin at the top where it starts to curve to make its way to the stem. Clean it out and scrap. Add drinks and pack with ice around the drinks. Pumpkins stays good for a long time since the ice keeps it cool so it doesn’t spoil. This entry was posted in Crafts ~ DIY ~ Projects, ~Halloween and tagged cool, cooler, decoration, DIY, drink, drinks, idea, pumpkin, ~Halloween, ~Party, ~Thanksgiving. Bookmark the permalink.